Pawson's other decisions in the 2-2 draw at the bet365 Stadium have already been subjected to scrutiny after he sent Jamie Vardy off for a challenge on Mame Diouf and gave the hosts a penalty for a debatable handball against Danny Simpson. And Pawson has now seen the last of the nine cards he dished out transferred to Martins Indi, rather than Pieters, whom he had assumed was the culprit of a 68th-minute foul on Danny Simpson. 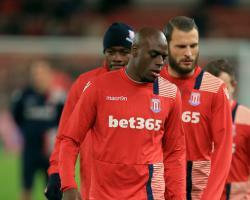 The Potters tweeted on Tuesday: "Erik Pieters' yellow card picked up against @LCFC has been transferred to Bruno Martins Indi in a case of mistaken identitiy #SCFC". Though Pieters and Martins Indi are both Dutch internationals, the former found it difficult to see how Pawson could have mixed the pair up. "It was not a yellow for me, I wasn't even close to this guy," Pieters said after the match. "I don't know what they're going to do with that but it was not a yellow card for me." Same colour, same hair, I think it's difficult to see..."
The Foxes, who face a Football Association fine having also had six players cautioned by Pawson, have already contested Vardy's dismissal on the grounds that they believe he was knocked off balance by Glen Johnson as he jumped in on Diouf. Pawson dismissed Vardy on this occasion having elected to only book Manchester United defender Marcos Rojo three days earlier for a two-footed lunge on Crystal Palace's Wilfried Zaha. His handling of that game, and his subsequent performance in Staffordshire, led former leading referee Howard Webb to call for him to be removed from the New Year's Eve fixture between Liverpool and Manchester City, while Keith Hackett, the ex-head of the Professional Game Match Officials Limited body, had suggested he should have been stood down from the Stoke clash in the first place. Pawson had even enraged the typically mild-mannered Claudio Ranieri in that contest, with the Italian confronting him on the pitch at half-time before being dragged away by his goalkeeper Kasper Schmeichel.